It has been such a short and crazy week with a holiday on Monday and Student Led Conferences today! It has also been strangely quiet with so many children off sick with fevers and coughs. I hope to see everyone on Monday. Thank you to everyone who attended Student Led Conferences today. The children were so excited to role play the teacher and demonstrate how to participate in the different activities within the classroom and share their knowledge. It was a real sense of pride for them to be able to teach their parents something they may not already know. If you were not able to join today, please know that you are welcome anytime. Our doors are always open for parents to visit. EARTH DAY is this Monday April 22nd. To celebrate this day, we are requesting that all snacks sent in that day are healthy and are not wrapped in any plastic that needs to be thrown away. We will also be practicing some other routines to help our earth that the children will hopefully share with you at home. This week K1 hosted a company called the “Zo Paper Project”. They are a business which is preserving and developing the traditional paper making of Vietnam. The children were slowly and carefully guided through the process of paper making. They worked in pairs to create one sheet of paper apiece and were quite fascinated by the results. I hope you all had a lovely week off with your child during the spring holiday. They are enjoying sharing their pictures that were sent in for Show & Tell. This week we began to tune in to our new unit of inquiry under the transdisciplinary theme Sharing the planet with the central idea: Understanding living things helps us share our environment and resources. We have a new fish tank in our room with some beautiful fish that the children love to observe and talk about. We have also cleaned up our garden in the back area of our classroom and have planted some new flowers and plants. This week we prepared for the APAC soccer tournament by talking a lot about how teams work together both physically and mentally to achieve their goals. To show support for our UNIS team, the children created headbands with Felix the Phoenix on the front. As we have been exploring patterns this week, the children worked really hard to create a pattern of their own on their headband by carefully cutting out different shapes and gluing them on. Please consider donating books to the UNIS Used Book Sale. You can send in any books in any language. Thank you for your support. Please check the Tin Tuc for more information. As there are Student Led Conferences next Friday, please note that we will cancel Show & Tell and resume the following week. Student Led Conferences have been used for many decades and their efficacy for promoting optimal student outcomes has been well documented over time. At UNIS Hanoi, we believe that children are in charge of their learning and we give them many opportunities to know that they are capable and that they can influence what happens to them. If you have never participated in a Student Led Conference you might be asking, “What is this all about?” Or “Why are children being included in conferences?” You might even be wondering when you are going to get a chance to “really talk” with the teacher about your child. We, too, have asked these questions and have spent a great deal of time researching and discussing the benefits to ensure that our teaching and learning is at the forefront of current educational theory and practice. Sports day was a success! It was the perfect weather for the festivities and a great location under the covered courts. Discovery and K1 did a group dance together to start it off and then participated in a variety of activities throughout the morning. The K2 Market Day was also a big hit. The children had fun buying such things as homemade cards, magic wands, robots, popcorn and lemonade just to name a few. Our first swimming lesson took place on Tuesday. The kids were so excited to put on their swimming gear and hop into the pool with Ms. Nikki and Mr. Martin. They were very confident and had lots of fun. Please remember that swimming will take place every Tuesday so please send your child with a swimming suit, towel, goggles and a swimming cap (if long hair). Also, every child will swim unless a doctor note is provided. We have also started looking closely at patterns. The children are creating them in their play and noticing them in their environment. They are all very excited to go on holiday. For Show & Tell the week we get back, please email a picture from your holiday for your child to share. If you don’t leave Vietnam, just take a photo of something special you did during the week. Please enjoy the pictures from this week. The children were very busy. The biggest event this week was the International Day of Happiness! Before K1 students arrived, the 10 Steps to Global Happiness were drawn on the ground with sidewalk chalk and paper smiley faces were put in all cubbies and on top of tables. The children arrived to Pharrell Williams’ song ‘Happy’ being played on the speaker, bubbles, and an option for face paint. Then we were lucky enough to be joined by a very special guest, our Head of School Ms. Jane Mcgee! You can imagine the excitement from the children. It is not often we have guests and so this was very special. She read a book titled “Mable Murple”. Jane had a lovely rapport with the children and they were very engaged with the story. She was also complimentary of our children and classrooms. The children brainstormed what makes them happy and how they can make others happy. They really put some thought into their responses. Please take a close look at the responses in the photos from the week. My apologies that I cannot add pictures directly on my page at the moment. This week, we read a book titled ‘A Squiggly Story”. It’s about a boy who doesn’t believe he can write a story and so his sister shows him how. He then goes on to share his partially finished story at school for Show & Tell. His teacher and classmates then gave him ideas to finish his story. This has sparked an amazing amount of bookmaking, collaborating and learning from others in the classroom. K1C also made a poster this week with their written names and then connected unifiix cubes representing the letters of their names. Then they did comparisons between their name and their peers noticing such things as letters that are similar, number of letters, uppercase and lowercase letters, spaces in names and names that are shorter or longer just to name a few. Next week for Show & Tell, please help your child bring in an object to tell a story with. An example of this could be a puppet. Swimming begins next Tuesday Mar. 26th. It will be just one time per week until the end of the year. Children will need a swimming suit, towel, goggles and a swimming bag. Please also send them in shoes that are easy to get on and off. All children will swim every Tuesday unless they have a doctor’s note. More information can be found in the Tin Tuc. K2 Market Day is next Tuesday Mar. 26th. Please send your child with 20,000VND to purchase treats and crafts made by K2 children. Sports Day is next Friday Mar. 29th. Please remember to send your child with a snack, water bottle and hat. Please find pictures from our week here. Thank you all for joining us for Open Classrooms this week. It’s exciting for the children to have you at school to share in their learning and it’s fun to capture the joy on their faces. It was great to see such fantastic parent participation as well. The clay project that we did on both Open Classroom days was inspired by our recent inquiry into names. The children have begun to use comparative language to discuss longer names, shorter names, letter names, letter sounds and who has letters that are the same. This clay name piece will be fired in the art kiln after it dries and then sent home to hang in a special place. This morning Camilla (Cami) the Counting Camel was introduced. She loves to sing her numbers and help children problem solve. Puppets are always a favorite with children and encourages deeper thinking. We have added some new loose parts to different areas of the classroom and removed others so the children have been inspired to create different meaningful pieces and work more collaboratively together. Next week, on March 20th, we will celebrate the International Day of Happiness. Our Head of School will be joining us on this day to read a story and share in the joy of K1. In honor of this special day, please have your child pick out something from home that makes them happy to share for Show & Tell. This could be a photo, a book, or even a family member (!). Please enjoy these pictures of the week. This week we continued our inquiry under the transdisciplinary theme How we express ourselves with the central idea: Storytelling allows us to share ideas, feelings and experiences. After reading the Jon Klassen hat book series last week, the children chose their favorite story out of the three and responded by drawing their favorite character in the book. This week we graphed responses and tallied them. The children also responded to why they liked the story. Ms. Beth visited our classroom today to introduce a new math game titled “The Tiny Dot Game”. It was very exciting and their are many different ways to play. We also read a story this week titled ‘My Heart is a Zoo’, which inspired the children to create animals made out of heart shapes. You will notice some of these in this weeks photos. This week we began looking at children’s names more closely and discussing what we notice. In the classroom, we have lists of first names, but now have added last names and buddy names of both 3C and 20/10. It has led to more letter discussion and writing. They also formed the letters in their name by cutting and shaping pipe cleaners which was a fun fine motor activity. Thank you for helping your child bring in a favorite stuffed animal from home to share for Show & Tell this week. They did a great job describing their animals, answering questions and expressing confidence in front of their friends. Next week for Show & Tell, please help your child choose a stuffed animal (again!) to share and snuggle up and read with. The stuffed animals have been great objects for using our descriptive language. We look forward to you joining us and participating in activities with your child. Please note, there will be no lunch available for parents in the canteen on this day. Coffee and snacks will be available for purchase. Here are some pictures of our week together. This week we continued our inquiry under the transdisciplinary theme How we express ourselves with the central idea: Storytelling allows us to share ideas, feelings and experiences. We read the John Klassen hat book series this week: ‘We Found a Hat’, ‘I Want My Hat Back’ and ‘This is Not My Hat.’ The children once again chose their favorite story out of the three and responded by drawing their favorite character in the book. Thank you for helping your child bring in a favorite story from home to share for Show & Tell this week. We read a book titled ‘Too Shy for Show & Tell’ on Monday which helped the children to prepare. They did a great job describing their book, answering questions and expressing confidence in front of their friends. Next week for Show & Tell, please send in a stuffed animal to share and snuggle up and read with. This week we welcomed a new friend into our K1C community. The children were very excited to welcome Hugh and are helping him adjust to our daily routines. We celebrated Ha Linh and Faye’s birthday this month. They turned five and moved their picture from the four year old birthday chart to the five year old birthday chart. We now have more five year olds than four year olds! This week we continued our inquiry under the transdisciplinary theme How we express ourselves with the central idea: Storytelling allows us to share ideas, feelings and experiences. 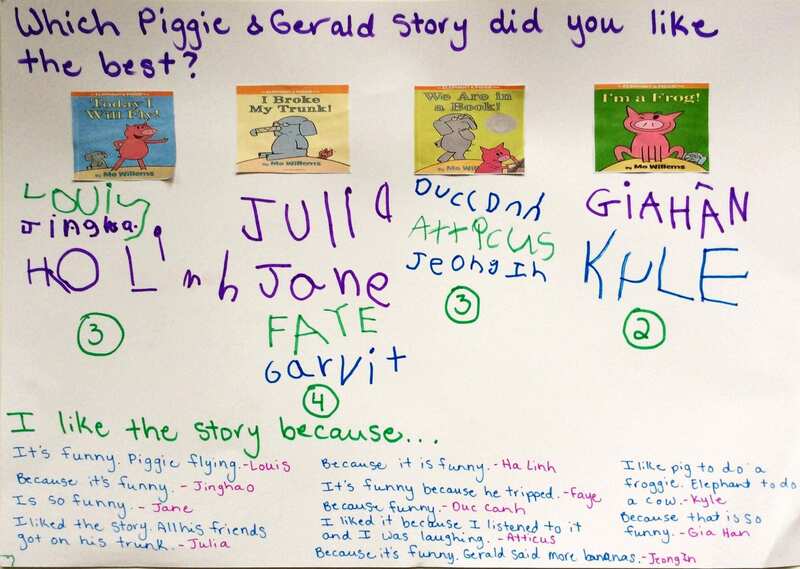 Last week, we focused on Piggie and Gerald books written by author Mo Willems. This week the children voted on their favorite Mo Willems story and expressed why they chose that particular book. They are truly appreciating storytelling and are connecting with characters. This is leading them to retell the stories in different ways through drawings, making puppets and role playing. Please have a look below at the results of the voting. We had a lovely guest reader from K2 visit us to read a Piggie and Gerald story that we don’t have here at school titled ‘Happy Pig Day’. The children were amazing and respectful listeners and gave her a big clap. Ms. Laura from Discovery B joined us today to share pictures and stories of her trip to Antarctica. This is a good connection to our line of inquiry communicating personal stories. The children were fascinated with the pictures of the different animals, icebergs and the ship. Yesterday, we celebrated UN Mother Tongue Day. Many students from the ECC went up onstage and said ‘hello’ in their home language. Julia was invited to the stage to say hello in Italian and Jinghao said hello in Chinese. Next week we will begin Show & Tell. I will email the list next Monday and it will begin on Tuesday. For Show & Tell next week, please help your child to pick out a book to share and describe. Please enjoy the pictures from the week. Welcome back! Hope your holiday was restful. This week we continued our inquiry under the transdisciplinary theme How we express ourselves with the central idea: Storytelling allows us to share ideas, feelings and experiences. 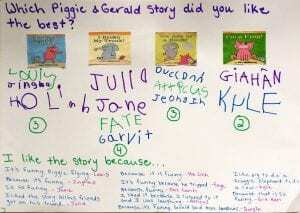 We have been focusing on Piggie and Gerald books written by author Mo Willems. The children are practicing giving their opinion about different stories. Next week, they will vote on their favorite Mo Willems story. They are also showing creativity and cooperation on our classroom stage using costumes and puppets to tell stories in different ways. Next Monday is the snack sale. Please check your email from UNIS as K1C is a contributing class. Next week I will be sending home a schedule for Show & Tell along with instructions. Show & Tell will begin the week after. Please enjoy our pictures of the week which include art projects and cooking.